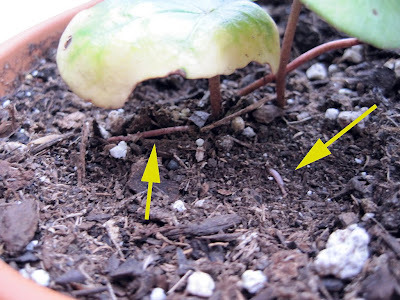 So, it appears some of my potted cyclamen are finally seeing some action. I have 8 pots on deck with six different species represented. The C. coum is almost entirely dormant and (hopefully) still alive after over-watering, with just a couple of leaves present. The c. balearicum and c. pseudibericum show no signs of growth or development. 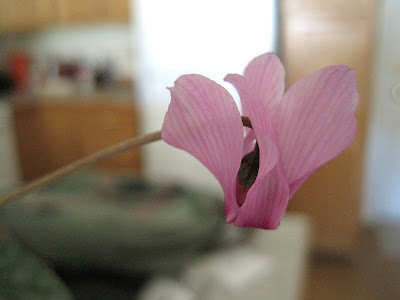 The c. repandum I acquired from the Kruckeberg Botanic Garden had one bloom when I got it, but has since then gone dormant. Of my two pots containing c. purpurascens, the one from Swanson's Nursery is blooming extensively (pictured above). 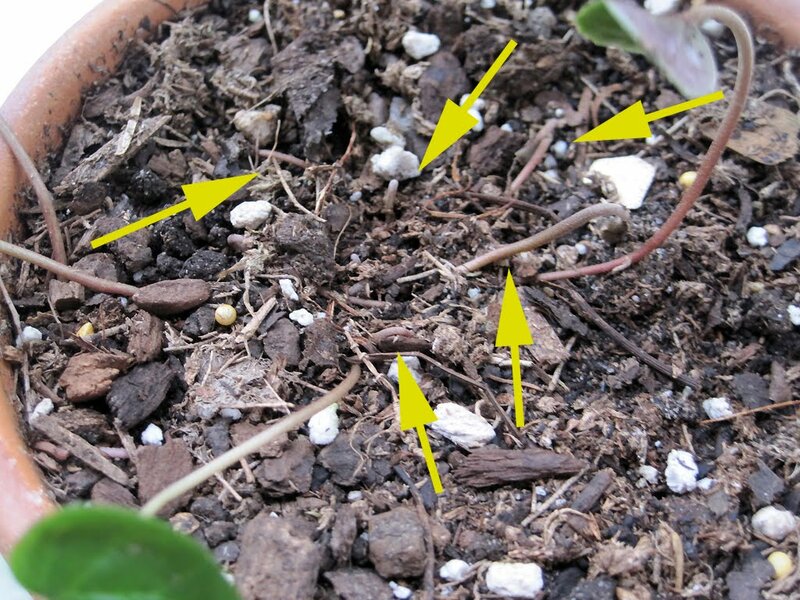 Not only does the plant have around two dozen flower buds ready to bloom, it has also sent out several new leaf stalks around its periphery. One other note, because of its location, this plant has been developing rather horizontally towards the light source. I'm planning on repositioning it so it will bloom "upwards"
My other purpurascens is not doing nearly as well. Pictured below, you can see it has maintained the original three leaves it had when I bought it from Hansen's Nursery last September. Unfortunately, one leaf is turning yellow and slowly dying off. I'm guessing some form of insect has been attacking it, and I'm thinking of bringing the plant indoors to better monitor it. Fortunately, the plant is finally seeing some new growth in the form of two newly emerging leaf stalks. Finally, the c. intaminatum (pictured below) is also experiencing change. It lost a couple of original leaves (since last September) about a month ago, with another one also showing signs of deterioration. Fortunately, I spy five new leaf stalks beginning to emerge. I'm looking forward to seeing how well the plant will do with the substantial new growth. 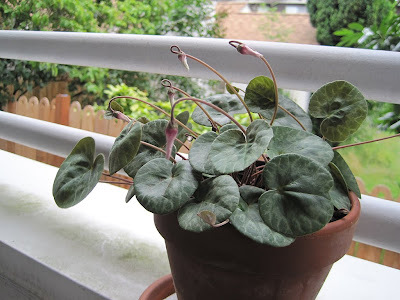 All in all, my cyclamen project is currently hit-and-miss. I'm hoping some of the plants will develop well enough to bloom in another year or two. Most of the tubers are about the size of a kidney bean and still have a ways to go. Well, summer is here at last and the residents in Seattle, WA are still waiting for the temperature to break 75 degrees. 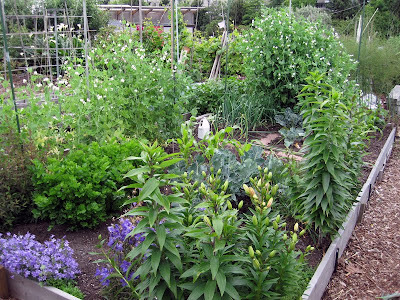 Thus, this year's growing season has been somewhat of a challenge for summer crops. At least my broccoli and peas are loving the cooler temperatures. 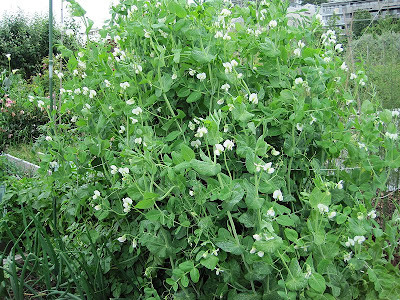 Usually, I harvest my peas the first week of July since Alderman variety take a whopping 120 days to mature. The pic below speaks for itself. Anyway, the celery is coming along nicely. The summer lilies are almost ready to begin blooming. 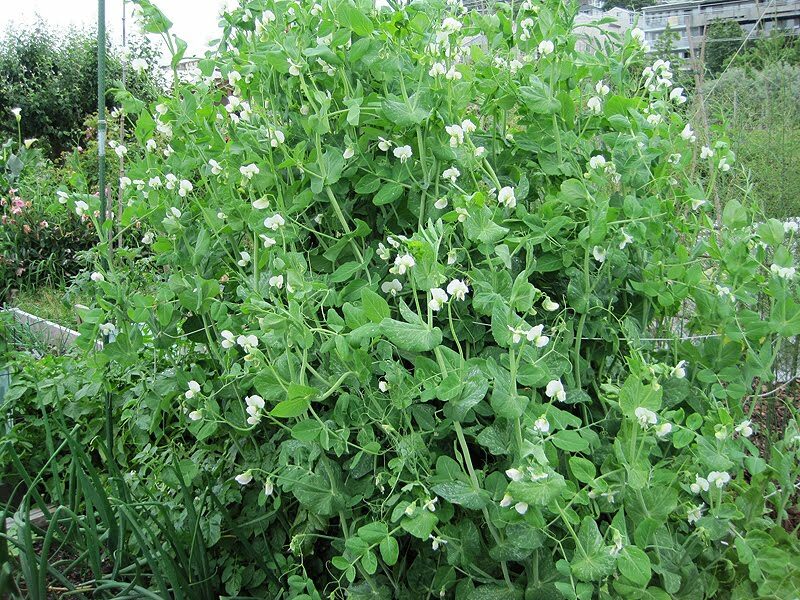 Furthermore, I've planted green beans between the pea trellis' and the potatoes that have already taken over the NE corner. Most of the replacement Jubilee corn starts in the newly clear 70sf are thriving. A few plants didn't make it and will need to be replaced. Also, I harvested my carrots that were grown from transplants. They ended up all twisted and gnarled, but were mostly edible.